I can’t remember much of Blast Off, honestly. I have some recollection about how the personalities of the other Combaticons, but I can’t tell you what Blast Off’s is. He’s apparently this loner jerk dude who stays up in space and is lonely. Also, I’ve always thought it was an odd choice that a military-themed team would have a space shuttle randomly be slapped into it. I mean, a missile trailer truck thing, a tank, a jeep, a helicopter… and a space shuttle. It’s kind of weird. In G1, Blast Off is a very aesthetically-pleasing dark brown shuttle. In G2, they decided to go the more realistic way of painting him white… but with the purple camo splotches that the G2 Combaticons all have. Come Fall of Cybertron and he’s basically that dude who never does anything. All four of the other Combaticons have some standout moment in the game narrative – Swindle and Vortex have entire levels to themselves, Onslaught is the leader and you hear his voice a lot, Brawl is a carry-over from the last game and is a relatively large factor in the Vortex level where your objective is to clear the area and help him shell the bridge or whatever. Blast Off is just… there. He shows up as Vortex’s wingman early in the level, does nothing and leaves. I really don’t have much to say about Blast Off. He never impressed me all that much. He looked great (if a bit boring) back in G1, but the Fall of Cybertron design is so weird and different… and it gets even more so in toy form. Blast Off apparently transforms into a Cybertronian shuttle. 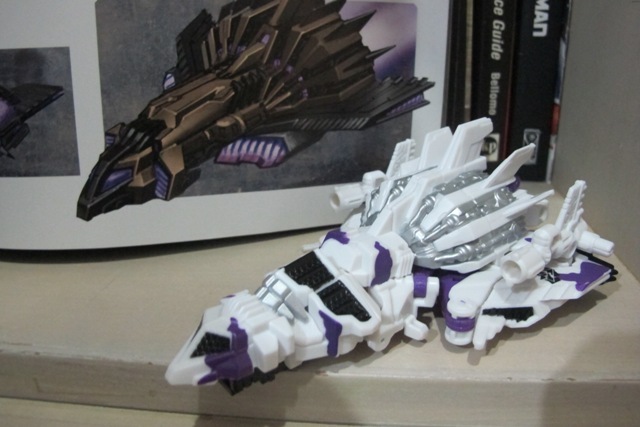 Apparently a lot of thought went into the design of Blast Off’s shuttle mode if the ‘Art of Fall of Cybertron’ book is anything to be believed… but I just don’t see that. In toy form, at least, Blast Off is a chunk with sculpted details and a ridiculous amount of tail-fins. He’s got seven tail-fins, plus two more if you attach his guns to him. He just looks messy, and barely has the general look of a shuttle. And where the game model has the focus on the big seven-winged engine thing on Blast Off’s back, as well as the gigantic exhaust ports on the shuttle’s rear, the toy slaps on Blast Off’s robot mode chest (actually made out of exhaust thingies under the wings) onto the nosecone of the shuttle mode, throwing in even more details to an already messy pile of random mechanical details. Also, the well-designed giant engines under that fan of tail wings? Nope, the toy does not replicate them. So all you get from Blast Off’s alternate mode is an inaccurate-looking mess of random shapes and details. Only the general shape, the engine block and tail fins resemble Blast Off’s in-game appearance at all. In the pictures I've taken I've placed comparisons with the control art from 'the Art of Fall of Cybertron'. It's pretty different, no? Blast Off gets the short end of the stick in all of his versions in terms of colours. In the game-accurate SDCC exclusive version, he’s randomly caramel and purple for some reason, looking okay but not quite nice either. The retail version randomly has him blue and yellow and generally looking almost as ridiculous as retail Vortex did. 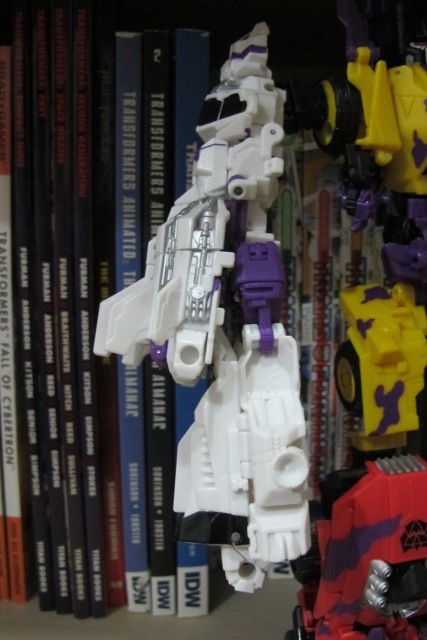 This G2-inspired deco is mainlywhite, with purple splotches. However, the engine block is free of purple splotches, and instead has silver lining the mechanical details under it. Added to this are black details picking out some of the robot-mode parts, the most egregious being the V-shaped chest slapped in the middle of the hull. It’s distracting. While the original G2 Blast Off looks great with a realistic white-with-black-rims paint scheme, that’s because it’s mostly streamlined. Fall of Cybertron Blast Off is a huge, veritable mess of raised mechanical details and shapes that the colour scheme choice simply makes him look nothing short of cheap. He looks even worse if you attach the two guns that came with him, since they cover even more purpe and black, making him look even more banal. The guns have fins on them, because the seven Blast Off already have are apparently not enough. Also, there’s no attempt to hide the highly conspicuous black chunk of connector port under the nosecone… although with the robot chest and feet clearly visible and picked out with black, I doubt they were even trying at all. As a result of his alternate mode, Fall of Cybertron’s Blast Off again has absolutely nothing in common with his G1 counterparts, other than the face. The face is pretty much a perfect Xerox of the G1 face. There’s no recognizable kibble placement, or robot mode layout, or anything at all. Blast Off’s nosecone (or rather, the robot chest/abdomen masquerading as a nosecone) flips down and forms his main body, his legs unfurl out in a rather weird way and the huge engine/tailwing ensemble form the shoulders, and the arms fold out from under it. It’s a pretty standard transformation, nothing particularly groundbreaking or spectacular. However, I absolutely hate how the upper arms and shoulders are designed. The giant shoulder pads are attached to the main body by ball joints… and the lower arm sticks out from behind it. Therefore, any attempt at moving the upper arm, like, say, to have Blast Off point his guns forward, will result in either the shoulder pad completely rotating to the back (which looks ugly) or pop off outright if you’re unfortunate enough to get one with weak ball joints. It’s not that big of a problem, but it still pisses me off nonetheless. 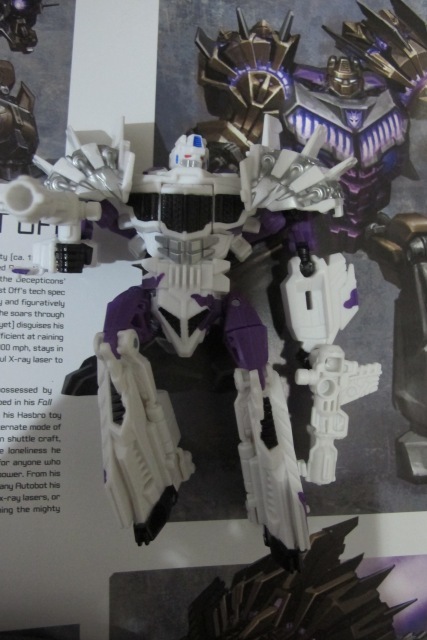 I also very much hate the small itty-bitty clip that holds the purple part which in turn connects to the giant shoulders via a ball joint. It’s a small clip that simply screams ‘I’m going to snap and break in the near future!’ This really add to the shoulder griping, and I really wished they made his shoulders better. Blast Off is fairly articulated, with a rotating head, ball-jointed shoulders (although I wished they had found a workaround for this), elbow joints, two joints on each thigh and a knee joint. His paintscheme is also fairly more cohesive robot, especially in my G2 variant, where the better distribution of purple and black really makes Blast Off less boring. He’s got neon blue detailings around his head, red eyes and a silver mouthplate. I also like his huge, chunky guns. The guns have two handles on each, perpendicular to each other. One handle is for attaching in shuttle mode, and the other to peg into fist-holes. The guns have huge barrels which look good in my opinion. 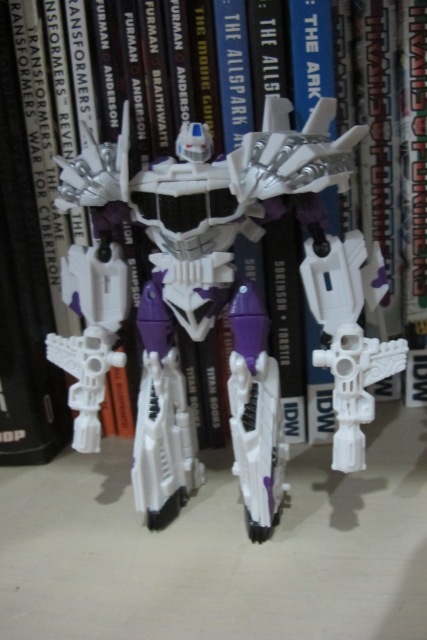 You can also peg the guns to the sides of his lower arms, which also kind of look good. Overall, Blast Off has a decidedly average robot mode, falling short of being good, but not exactly bad either. Let’s get the leg mode out of the way first, shall we? Blast Off generally becomes one of Bruticus’ arms, which makes sense since both he and Vortex turn into airborne vehicles, but that’s a huge can of worms so I want to cover the easier one first. 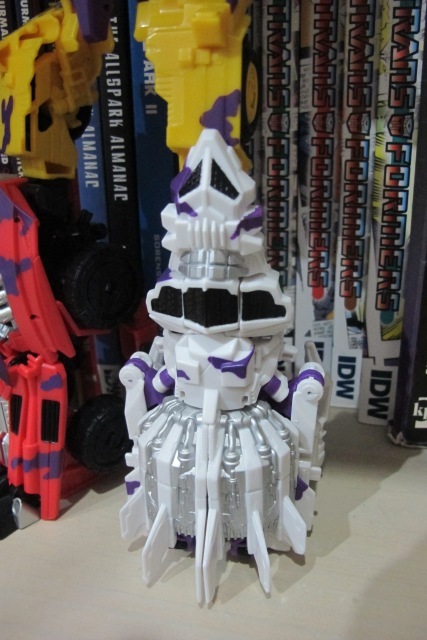 So anyway, Blast Off’s leg mode is basically you moving the nosecone slightly out of the way to fully expose the connector joint, fold in the robot legs that jut to the sides, and thus you get the leg. A vehicle standing up. Very stable, although it’s a bit stiff and ever so slightly taller than the other limbs, giving Bruticus a slight limp if you mis-transform, say, Vortex-as-a-leg. Of course, you can attach Blast Off's guns to the sides of his legs, giving Bruticus some Predaking-esque cannon toes. Would screw up the balance a little, though, with the pegs poking into the ground and everything. His nominal placement is as Bruticus’ arms, however, and that’s really weird. Properly transformed (i.e. according to the instructions) it’s ridiculously wrong and seems to be mis-transformed. Basically, the entirety of Blast Off’s shuttle mode becomes the upper arm, and his robot-mode legs become the lower arm. Bruticus’ fist (with two thumbs depending on which hand you want Blast Off to turn into) fold out. The end result is that the hand reaches nearly lower than Bruticus’ knee, whereas all three of his other hands only reach the thighs, as proportional arms do. It’s also ridiculously gangly and hollow-looking, making him look very much mistransformed. With this G2 colouring it’s even worse, since again he’s a big mass of white. 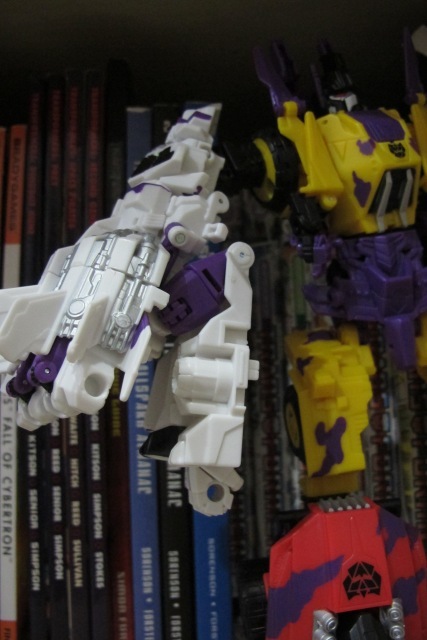 The Bruticus fist that folds out is white as well (it’s black in all other versions of Blast Off), making it completely lost in the sea of random white shapes and details. Looking it from the medial part of the arm also gives you the very unappealing view of hollow parts that are normally hidden on the underside of vehicle modes… in combined form it’s exposed for everyone to see. It doesn’t help for me to point out that compared to the in-game artwork, Blast Off is oriented the wrong way, does it? The huge engine tailfin thing should be pointing the other way, and should be on the lower arm to boot. Not so in toy form, making Blast Off very inaccurate in combined mode. As an arm, Blast Off is articulated at the shoulder, elbow and fist, albeit in limited amounts. In the game, the Blast Off arm is able to transform into a flamethrower, and while the proportions will be wrong I suppose you can fold Blast Off’s robot legs back into the shuttle and appropriate some kind of… flamethrowery-thing. It doesn’t really work that well since you’re basically pointing a huge mass of kibble instead of the game’s giant shuttle engines. There are a lot of ways to turn Blast Off into a more proportional arm. Some have offered alternate transformations, but these kind of look weird, especially since Blast Off’s robot head pokes out from Bruticus’ shoulder. You can make his lower robot legs double up on his thighs, which would shorten his arms to a more proportional length… but by doing so it's terrible difficult to connect the Bruticus fist halves together. Well, you can (shown in my picture), you just run the risk of putting some horrible stress marks on your Blast Off, effectively adding yet another part where he’s doomed to shatter in the future. I managed to take that picture before I broke my toy, but the alteration is so fiddly and I'm afraid to ruin him, so I'm never going to do it again. In both modes, Blast Off has a rotational joint midway in the fuselage. It’s useless in alternate mode, and is neutered in robot mode, so one can only assume it’s supposed to take part while combined. As a leg I suppose it allows Blast Off to rotate? As an arm, it gives Bruticus an additional bicep rotational joint. Kind of pointless since the rest of Blast Off is so heavy and it’ll probably reset to its original posture anyway. Transformation Design: 3/10 It’s fairly unremarkable and would probably pass off as a five, although as before, Blast Off’s shoulders is a huge, weird problem that hurts both his articulation and durability scores. Durability: 4/10 He’s fairly decent and durable, unless you try to shorten the Bruticus arm and put unnecessary stress marks on him. There is, however, the aforementioned problems of the tiny clips on the sides of his chest which are just asking to be snapped apart. Aesthetics: 3/10 The original G2 Blast Off looks great. This one is very messy, and the white makes him look cheap and cluttered instead of sleek and smooth. His vehicle and combined modes, in particular, look really messy and unfinished. Articulation: 4/10 Blast Off has a fair bit of articulation, although slightly below-par for a normal Deluxe class toy nowadays. Fun: 5/10 Despite all my bitching Blast Off is actually relatively fun to fiddle around with. Having a nice set of guns helps a fair bit. Value/Price: 4/10 He’s a fairly poor toy, and he’s only worth it if you’re gunning for the full Bruticus set. Overall: 3/10 Like I said above, he’s only worth it as part of the full Bruticus set, where the combination gimmick kind of oversets the fact that Blast Off is a horrible toy. Not as horrible as Onslaught since Blast Off still has robot articulation and some semblance of an alternate mode instead of Onslaught’s horrible-ness, but Blast Off is still pretty poorly designed.